With increasing frequency, it happens each year – scorching temperatures exceed regional norms, enduring for days or even months at a time. These exceptionally high, extended temperatures lead to power outage, health risk, and personal loss in the form of wildfires – a natural disaster that puts family members, property, communities and the environment at risk. Despite preparation and dedication, government agencies and emergency services find themselves struggling to allocate resources to defeat extreme-heat events. However, you have a part to play in protecting your own life, the lives of those you love, your home and possibly even your neighbors during wildfires. This guide will help you prepare for extreme heat and the devastation that often follows in its wake. Learn how to prepare, survive and minimize the damaging effects of wildfires. Although heatwaves are technically meteorological events, they have a very human impact. The EPA cites heatwaves as the “leading weather-related killer in the United States;” their fatalities outstrip even those from severe cold, lightning, hurricanes, tornadoes, floods and earthquakes. In 2015 alone, India, Pakistan, parts of the Middle East, Western Europe as far north as the Netherlands, Canada and even the United States all suffered prolonged periods of extreme heat, record temperatures and the seemingly inevitable accompanying human fatalities. North American summers are hot, with heatwaves settling over regions of the United States and even Canada. Historically, Centers for Disease Control and Prevention cumulative averages from 1999 to 2009 indicate that about 660 Americans succumb yearly to the demands of summer heat. However, researchers from Emory University focusing on the typically cooler, moister East Coast anticipate that those numbers are likely to increase. From 2002 to 2004, 187 people in just the eastern third of the United States succumbed to heat waves. With heatwave frequency expected to at least triple, East Coast numbers could exceed 2,000 within the next four decades. Meanwhile, a study from the National Center for Atmospheric Research also expects heatwaves and the resulting fatalities to increase worldwide, with the most severe affecting the U.S. West and South. In 2003’s heatwave in Europe, an estimated 15,000 Parisians died. Death tolls across Europe were estimated to be as high as 70,000. Yet, in 2006’s heatwave in Europe, fatalities were greatly reduced – primarily due to alert systems and education campaigns informing people of what they should and should not do when temperatures reach 90 or more. Being prepared and knowing what to do make a difference. Because heatwaves can be so devastating, the National Weather Service geared its Heat Index to address “apparent temperature” rather than the number on a thermometer or digital readout. The index combines relative humidity with air temperature to calculate an accurate measure of heat load on a body – also often called the misery index. So, while a thermometer may read 90, when relative humidity is at 40 percent, your body will respond as if the temperature is 91. That same 90 becomes equivalent to 100 at 60 percent relative humidity, 106 at 70 percent, 113 at 80 percent, 122 at 90 percent and 132 at 100 percent. As the index demonstrates, one temperature can span the full gamut of color-coded warnings, from caution to extreme danger. However, the Heat Index values were calculated for shady, light-wind conditions, so direct sun exposure or strong, hot, dry winds can drive temperature values still higher – as much as another 15 degrees. Whatever the external air temperature, your body’s goal is to maintain a perfect internal 98.6. To do that when temperatures rise, your heart will pump more blood, and blood vessels will dilate so that blood circulating close to the skin’s surface can release heat. Your body will also sweat in order to be cooled by evaporation, and you may even find yourself panting if your blood temperature rises above that perfect 98.6. Under normal conditions, heat radiates into cooler air, and sweat evaporates into drier air. When high temperatures combine with high relative humidity, however, nothing works as intended. Your heart accelerates, and blood flows, but the heat remains. Your sweat glands drench you in perspiration that doesn’t evaporate, yet depletes stores of essential electrolytes. And as your body is unable to compensate, your core temperature rises, and physical symptoms ranging from sunburn or fatigue to heat cramps, heat exhaustion and heat stroke express your body’s distress. While many symptoms of the body’s inability to maintain optimal temperature correlate to Heat Index value thresholds, a number of factors make some people more likely to experience difficulties than others. Foremost among them is where you live. In fact, people living in moderate climates are often more susceptible to reactions simply because they’re not accustomed to dealing with excessive, sustained heat. Lack of access to air-conditioning – whether due to poverty or power outages – compounds the problem. As would be expected, elderly people with medical conditions living alone on fixed incomes in older, lower rent apartments that lack central air-conditioning systems are often most at risk. Regardless of whether you live in an urban or rural setting, when temperatures cross certain Heat Index thresholds, the National Weather Service alerts the public to the danger. Those alerts that you see on TV weather reports and hear on the radio are real and will alert you to the Heat Index values, how serious the hazard is, who is most at risk and what you should do to remain safe. The National Oceanic and Atmospheric Administration (NOAA) also broadcasts its warnings and advisories over its own Weather Radio All Hazards network – which also has an app to alert users of extreme weather conditions. The hardest concept for many people to grasp is the difference between an excessive heat outlook versus a watch, advisory or warning. The first two have to do with time; the outlook addresses excessive heat anticipated within the next three to seven days, while the watch is for imminent heat due in 24 to 72 hours. Advisories and warnings are issued once excessive heat arrives and is expected to last for two or more days. The difference is in the temperature thresholds: as a general rule, advisories are for Heat Index temperatures that exceed 100 during the day and remain above 75 at night, while warnings kick in when daytime temps hit 105. Despite the differences between them, all are actionable. Whether you need to make arrangements for family just in case or you’re debating if you should relocate a social outing, paying attention to the Heat Index and taking the suggested precautions can save lives. Plenty of public indoor areas like libraries and malls are air-conditioned. Even just taking a drive in an air-conditioned car can give your body a break from the heat. Sunburn: The painful redness, swelling and blistering may come with fever and a headache, too. While over-the-counter ointments can sooth intact skin, open blisters require a sterile dressing, and severe burns affecting large parts of the body need medical attention. Heat Cramps: Usually the painful muscle spasms will affect your abdomen and legs, and you’ll sweat heavily. Apply firm pressure or massage cramping muscles to relieve spasms, and sip water slowly to hydrate. If you feel nauseous, get medical attention. 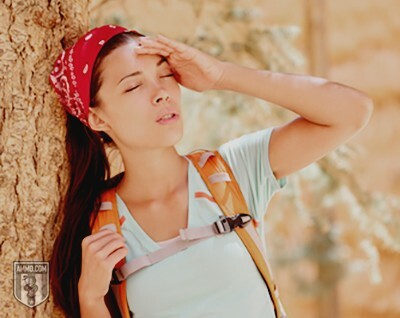 Heat Exhaustion: When heat reactions include heavy sweating, weakness, and cold, pale and clammy skin – the person’s pulse may become thready, and they may even vomit or faint. If you must wait for medical attention, interim first aid measures can include loosening or removing their clothing; applying cool, wet cloths to reduce body temperature; and moving them to a cooler area. Heat Stroke: A severe emergency, heat stroke demands immediate medical attention. Because the person’s body has no more liquid to sweat, delay can be fatal. Their skin will be hot and dry, their body temperature will be 104 or more, and their heart will be racing. They may even become unconscious. If you must wait for medical help to arrive, move the victim to a cooler area, remove their clothing, and use cold water to reduce body temperature. While heatwaves typically start with high temperatures and thick humidity, extended periods of heat eventually evaporate surface moisture and continue with searing temperatures that dry both the air and an area’s terrain. Unfortunately, fierce heat can transform regional environments into living tinderboxes. 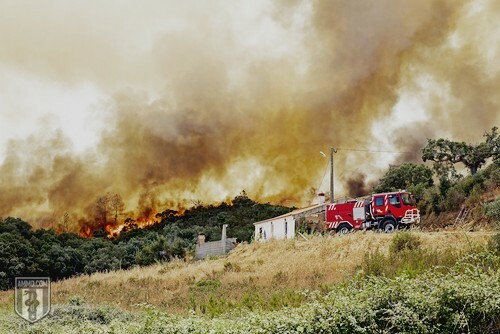 Whether the cause is lightning or – far more common – human behavior, land suffering from a heatwave is a prime setting for wildland fires, also known as wildfires. The year 2015 set new wildfire records in the United States, with nearly 70,000 wildfires consuming more than 10 million acres – versus the annual average 6.5 million – and thousands of homes, according to the National Interagency Fire Center. State-by-state analysis proves that no region is completely safe from wildland fires. In fact, a U.S. Forest Service report detailed that more than half of its $5.1 billion budget went to wildfire suppression and preparedness – a share that could be as much as two-thirds by the year 2025 if trends continue. The report also specifically stated that “Climate change has led to fire seasons that are now on average 78 days longer than in 1970” and that last up to 300 days in many parts of the country. Add increasing development near or in forested areas, limited water availability and unprecedented levels of fire-prone vegetation to accidents, arson and lightning, and wildfires become a very real possibility. Wildland firefighters are trained to protect natural resources, not homes or buildings. Diverting precious wildland fire-control resources to save personal residences is not only costly, but also often futile. Once a fire starts outdoors in a rural area, it’s hard to control due to these areas being far from fire stations. Emergency response times are much longer. And even once help arrives, water supply is often too limited to be useful. Research conducted for the U.S. Geological Service found that beyond historical wildfire areas designated on maps, actual geographical location was important in a home’s ability to withstand a wildland fire. When analyzing wildland fires in Southern California, the study’s authors found that low-density homes that were intermingled with wildland and situated in the paths of wind corridors were particularly vulnerable. Wildfires often gain strength as they run uphill, with steep, hilly terrain making fire-resistant building materials and wildfire-defensible zones even more important. In short, you need to identify your level of risk simply by where you live. While many homeowners long for a home that mirrors the surrounding environment, wood, shake shingles and cedar siding are not the best options. Winds can carry live embers up to three miles in advance of a flame front and ignite multiple homes at a time, further compounding wildfire control problems. Choosing fire-resistant Class A roofing materials like clay tiles or asphalt fiberglass composition shingles for your home and other structures is optimal, with Class C – the minimum – suitable for only light fire exposure. Don’t forget outdoor structures as well as fencing on the property. Even choosing multi-pane windows and tempered safety glass can protect from radiant heat. If you lack documentation on what class your roofing system or other building materials are, a reputable roofing professional or building inspector should be able to advise you. Keeping trees and shrubs pruned and trimmed away from your home as well as cleaning up twigs and leaves that collect against foundations also helps. Again, choosing the most fire-resistant materials, using only fine-mesh screens and keeping areas clean and tidy will let your Class A roof and other fire-resistant building components perform unimpeded. A wise design for the area immediately outside your home can save it from wildfire. The trick is to think in terms of a 100-foot-deep radius and to create a landscape that will deny fuel to a fire. You don’t need to make it a dead zone, but you do need to remove or mow brush, thin trees and keep them free of dead wood and low-hanging limbs within 15 feet of the ground. In deciding what to keep, deciduous hardwoods are better choices than sappy – and more flammable – evergreens like pines, eucalyptus or juniper. Nearest your home within the first 30 feet, non-oily herbaceous plants are preferable to shrubs, which are best kept low, about two feet in height. Mulch, wood chips and pine straw degrade quickly and are highly flammable. So for landscaping flowerbeds and other covered areas, consider rock, gravel or living ground covers like sedum or ice plant. Storage is a danger that homeowners often overlook, keeping many otherwise dangerous supplies too close to doorsteps out of simple convenience. 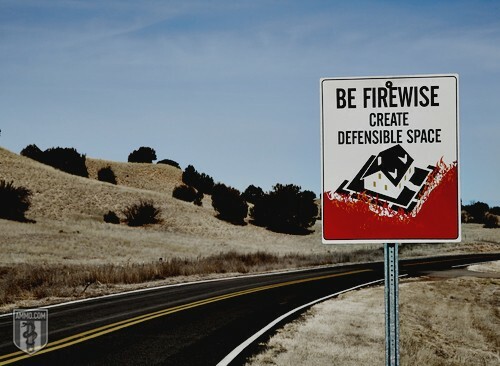 Flammable materials like gasoline, kerosene or other solvents can not only burn, but also explode – so keep them in metal containers well outside the inner, 30-foot zone. The same goes for stacked firewood. A well-seasoned woodpile can quickly become a marathon bonfire that will release embers into a wind for hours, if not days. You can also ensure your family and property will have every advantage by clearly marking the entrance to your property with address signs that are easily seen from the road. Keep the driveway or access road free of debris and flammable brush – at least 16 feet wide – with adequate turnaround areas. If you have water sources, such as a hydrant, pond, swimming pool or well, keep all of them well-maintained, with accesses that emergency vehicles could use. Hopefully, the worst will never come to pass, but you need to be prepared if it does. With wildfires, evacuation may be your only safe option. Usually, officials issue an evacuation order through public media, complete with mandatory escape routes and deadlines, and residents must leave in their own vehicles. However, since most fires are identified by regular citizens through 9-1-1, you may be the first person to spot the dreaded crown of fire. For your personal interim safety, develop two fire escape and evacuation plans – one for if emergency personnel must reach you and another one for self-evacuation. Your plan can’t stop at ensuring everyone makes their way out of the house to a safe meeting spot. That meeting spot is useful for ensuring everyone who needs to evacuate is present, but chances are, it won't be safe long-term. You'll need a contingency meeting area if your first choice is too dangerous. In addition, you'll also need a separate plan for pets and livestock, as disaster relief centers do not typically extend emergency services to animals. Sometimes, despite the best planning, family members become separated. Having a designated family friend or relative who lives outside of your area to act as a unifying contingency point of contact can ensure that every member is accounted for and able to be evacuated. Especially during a disaster situation, when communications systems tend to become overloaded, having a central point of contact for text messaging may succeed in keeping lines of communications open and effective. If wildfire becomes even a remote possibility, keep in mind that winds can shift quickly, and so can a wildfire’s direction. To ensure you can leave at a moment’s notice, back your car into your garage or an open space facing the direction of escape. Keep doors and windows closed, but leave the keys in the ignition and the doors unlocked. Keep the garage doors and windows closed, but disengage any automatic garage door openers in case power fails. Stow a case of water in the trunk, and keep an extra set of car keys with you just in case. This way, all you have to do is herd everyone into the car and leave. Outside, you’ll want to eliminate all fuel sources for the fire. Denying the fire air and soaking the perimeter can slow or even prevent a wildfire from gaining a foothold on your property. Keep fire tools handy: key items include rakes, axes, handsaws, chainsaws, buckets, shovels and wet blankets. Even if you can’t use the tools immediately, you’ll want them when you return. You cannot return home until officials declare the area safe. 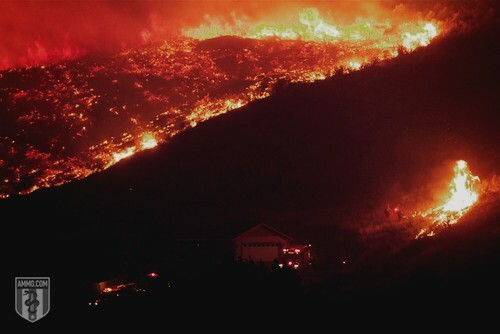 Controlling the wildfire may take days or weeks, and officials can’t allow you back into the area until they can be sure that the danger has passed. When you do return, you’ll want to alert your homeowner’s insurance provider and take plenty of pictures for documentation. You’ll also need to contact your local authorities to let them know that you’re back, because even if your home appears intact, you still might need emergency assistance. First, smoke from wildfires is extremely high in pollutants and other particulate matter. 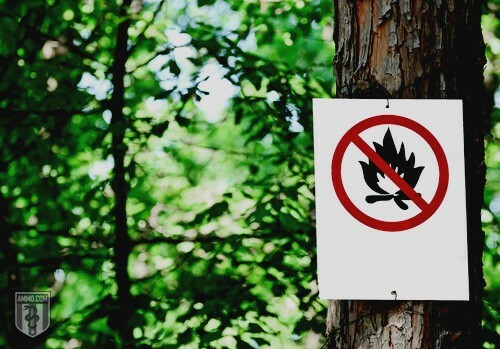 When certain plants like poison ivy or poison oak burn, their oils become concentrated in smoke that can cause severe skin rashes; if inhaled, the smoke can prove fatal. If homes or other structures burn, the building materials and contents may release additional toxins into the air that not only are harmful if inhaled, but can also settle as toxic soot. Areas can smolder for weeks or even months after a wildfire, releasing a dirty smoke that can drift for miles and affect the eyes, heart and lungs. For individuals with health issues, respiratory distress coupled with the emotion of seeing a home struck by natural disaster, it can be overwhelming. Especially if a heatwave is still in force, take preventive measures to stay hydrated, and watch for symptoms of heat exhaustion. For your home and surrounding property, hidden sparks and smoldering embers are the greatest danger. Embers can last weeks after a wildfire, and holdover fires from tree roots and fallen or buried debris can re-ignite long after a wildland fire is “over.” Walk your property to check for hot spots like tree stumps or piled vegetation – burned or intact. Soak down any you find, alert local fire authorities, and continue to monitor them carefully. Even if your home appears untouched, check the exterior for hidden embers – especially the roof – as well as inside the attic and around vents and exterior accesses. You’ll also need to test your home’s systems for heat damage to ensure they’re functioning properly. If you didn’t disconnect your appliances before you left, be sure to shut them down before turning the power back on. Then, you can add appliances one by one, as long as the electrical system bears the load. If you experience any issues, turn off the breaker, and call for professional assistance or – if appropriate – 9-1-1 for emergency services. Outbuildings, including well heads, require the same degree of vigilance. While systems within a home may have escaped damage, other buildings or features on your property may be dangerous. Melted wiring can short out and spark, damage otherwise intact equipment, and all too easily re-ignite a wildland fire. Unfortunately, homeowners often don’t realize that wildfire alters the very ground. What once was loamy forest soil may be baked into an unyielding crust that cannot absorb rainfall. Drainage patterns may change, and heavy rains can cause flooding, mudslides and landslides. Never underestimate the power of heat. It can bring the strongest of us to our knees. It can burn. It can destroy. It can kill. And it can take our property, our livelihoods and our lives. When temperatures soar, heed the National Weather Service’s issued Heat Indexes. Truthfully, no one can be certain of exactly how many people experience medical emergencies due to heat, but nearly everyone agrees that actual numbers are probably higher than those reported. Similarly, extended periods of heat create a perfect environment for wildland fires. The U.S. Forest Service and other authorities issue burning restrictions and set fire danger advisories, but being prepared for a disaster may prevent one. For more information on wildland fires, check out Firewise, the Forest Service’s national program providing guidance for communities to prevent and combat wildland fires.